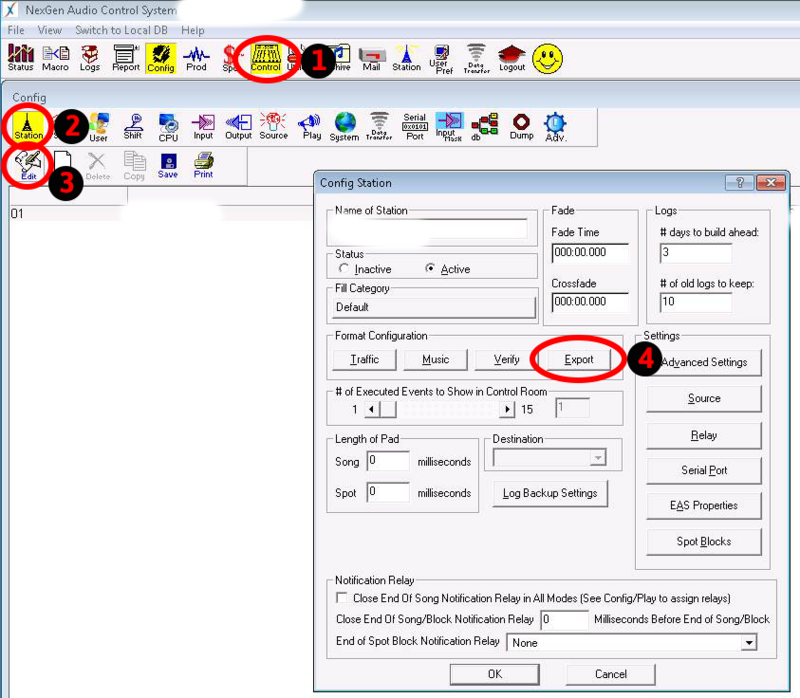 RCS NexGen is one of the most popular FM Automation Systems in Australia. If you have it, you might be wondering how to export the live Now Playing data to your website. Thankfully, it’s actually pretty easy to send this data as XML to your website. The Export setup screen is buried several levels deep in NexGen’s setup screens. 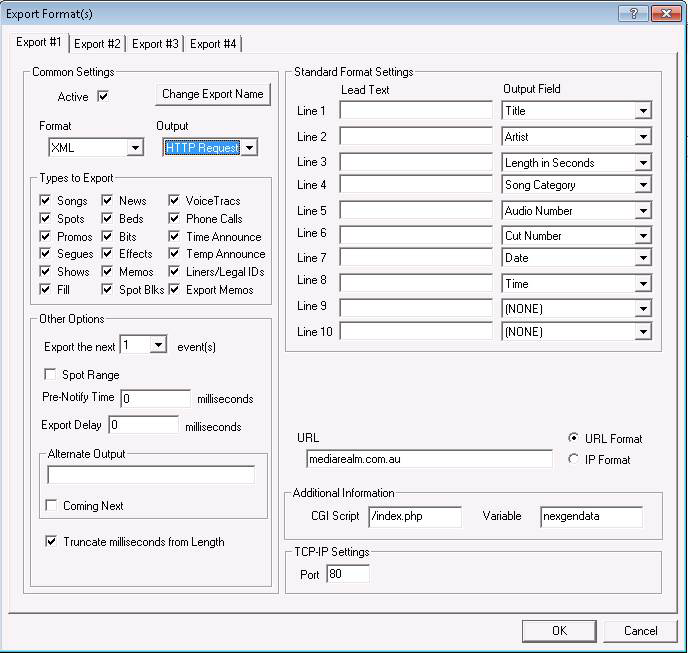 You can configure up to four separate export formats. Pick a spare one from one of the four tabs at the top of the window, and then start checking the boxes! The format ‘XML’ with Output ‘HTTP Export’ is probably one of the best formats, as it allows you to send data directly to a script on your website as soon as the item start playing. Each “Output Field” is one XML element that will be sent to your script. If you fill out the “Lead Text” you’ll get extra text appended to the data, which you probably don’t want. Leave the “Lead Text” fields blank, and set the Output Fields to the fields you’ll need on your website. Port: Probably port 80. I don’t think NexGen supports HTTPS, only HTTP. Of course, this server will need to be accessible from your NexGen A-Serv (Audio Server) that controls this server. When you save the settings, you’ll be prompted to restart this A-Serv. Changes won’t take affect until you restart the appropriate process on the A-Serv. // Is the file is currently playing? This script writes the file “nexgen_now.json” with some of the most important fields saved. You can easily read this file on your website and output the fields as needed. Of course, you’ll need to add some error checking and all that important stuff. You could also log it to a database in order to create a “Song Finder” (a directory of songs played, sorted by time and date). You could also show weekly play charts. Use my script as a starting point for capturing this data. Cool! I’ve integrated several playout systems with websites before (including NexGen, Zetta, Simian, ZaraRadio, and StationPlaylist Studio), so I’m sure I can help you with this. Send me an email if you’re interested in hiring me for this project.